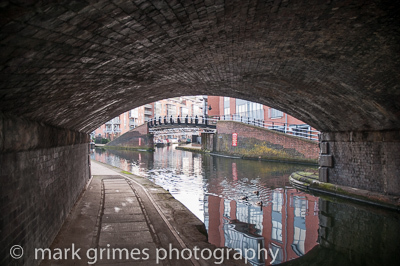 This image was taken from under St. Vincent bridge which takes St. Vincent Street over the Birmingham Canal Main Line in the Ladywood area of the city. The view looks towards the new development of apartments that were constructed around the Oozells Street Loop and shows the new bridge built off the original abutments, in place since the straightening of the main line in 1827 by Thomas Telford. This one is one of my favourites! I can’t quite put my finger on it, but I think it’s the fact that when you look at the reflected surface of the water you can see more of the building (in its reflected form) then when simply gazing through the aperture of the bridge. Nice touch! Frankly, I’m mystified as to why this one hasn’t attracted more praise from the fanbase.